A project showing how negative attitudes about stress impact key factors that influence vulnerability to addiction, including sleep, emotion and cognition, won a first place Addiction Science Award at the 2016 Intel International Science and Engineering Fair (ISEF)—the world’s largest science competition for high school students. The awards are coordinated by the National Institute on Drug Abuse (NIDA), part of the National Institutes of Health, and Friends of NIDA, a coalition that supports NIDA’s mission. The Intel ISEF Addiction Science Awards were presented at a ceremony Thursday night at the Phoenix Convention Center in Arizona. 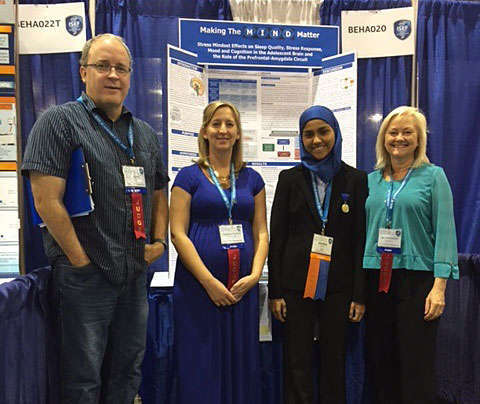 The first place distinction was awarded to 15-year-old Kashfia Rahman, a high school sophomore at Brookings High School in Brookings, South Dakota, and the recipient of last year’s third place Addiction Science Award distinction. Her project, titled Making the Mind Matter: Stress Mindset Effects on Sleep Quality, Stress Response, Emotion and Cognition in the Developing Adolescent Brain and the Role of the Prefrontal-Amygdala Circuit, found a direct correlation between a teen’s negative outlook on stress and a negative physical stress response that adversely impacts sleep quality, emotion and cognition. Adolescents were divided into two groups, with either positive or negative mindsets about stress. The young scientist then used tools to assess various neurobehavioral dynamics, including sleep quality, mood, anxiety, attention and working memory. "This novel project shows us how a teen’s approach to handling stress can impact addiction vulnerability, particularly in the developing brain," said NIDA Director Nora D. Volkow, M.D. "Ms. Rahman’s work may ultimately help scientists develop new and innovative programs to prevent substance use." The second place distinction went to 15-year-old Lindsay Poulos, a sophomore at the Episcopal School of Jacksonville in Jacksonville, Florida, who explored whether e-cigarettes might be a healthier alternative to traditional cigarettes. Her project, The Effects of E-Cigarette Vapor on Drosophila melanogaster, found that fruit flies exposed to e-cigarette vapor showed evidence of gene mutations, demonstrating that health risks exist with e-cigarette nicotine delivery systems. Winning third place was 18-year-old Rachel Mashal, a senior at John F. Kennedy High School in Bellmore, New York. Her project, titled Development of a Caffeine Addiction Paradigm to Examine How Dietary Restriction and Level of TOR Signaling Modulate the Effects of Drugs, found that dietary changes protected adult fruit flies from the negative effects of caffeine. While caffeine is not considered an addictive drug, her project found that male fruit flies are more vulnerable to some of the negative effects of caffeine during development and in adulthood than are the female flies. The judges offered honorable mention distinctions to two additional projects. The first, conducted by two 17-year-old seniors Matthew Forman and Jack Lepkowski, both from Ossining High School in Ossining, New York, explored ways to reduce ADHD symptoms and PTSD severity. The second, conducted by 17-year-old Alexus McBride, a senior at Roanoke Valley Governor’s School for Science and Technology in Roanoke, Virginia, explored the use of social media in recovery and relapse prevention. Judges for this year’s Addiction Science Award included three NIDA grantees from Arizona State University: Janet Neisewander, Ph.D.; M. Foster Olive, Ph.D.; and Cassandra Gipson, Ph.D.
"The fact that this year’s first place winner is a previous Addiction Science Award winner is indicative of our program’s purpose — to encourage bright, young researchers to continue work in the exciting field of addiction science," said William Dewey, Ph.D., president and chair of the Executive Committee, Friends of NIDA, as well as the Louis S. and Ruth S. Harris Professor and chair, Department of Pharmacology and Toxicology, Virginia Commonwealth University, Richmond. This year, about 1,700 students from more than 75 countries, regions and territories participated in the Intel ISEF competition, coordinated by the Society for Science and the Public. The nonprofit organization partners with Intel—along with dozens of other corporate, academic, government and science-focused sponsors—to provide support and awards each year. Addiction Science Winners receive cash awards provided by Friends of NIDA, with a $2,500 scholarship for the first-place honoree, $1,500 for second place and $1,000 for the third place distinction. NIDA has developed a special section on its website, which includes other resources on addiction science, to highlight the winning projects and to help science fair entrants understand the criteria for the awards: The NIDA Science Fair Award for Addiction Science. NIDA. "Link between stress mindset and factors that influence addiction vulnerability—focus of top NIH Addiction Science Award ." National Institute on Drug Abuse, 13 May. 2016, https://www.drugabuse.gov/news-events/news-releases/2016/05/link-between-stress-mindset-factors-influence-addiction-vulnerability-focus-top-nih-addiction. NIDA. Link between stress mindset and factors that influence addiction vulnerability—focus of top NIH Addiction Science Award . National Institute on Drug Abuse website. https://www.drugabuse.gov/news-events/news-releases/2016/05/link-between-stress-mindset-factors-influence-addiction-vulnerability-focus-top-nih-addiction. May 13, 2016.